-6- SYSTEM INFORMATION Conversational Programming System has been operational since December 1, 1969. CPS operates out of Large Capacity Storage (LCS) and provides interactive programming facilities for up to 16 concurrent users. At the present time 8 telephone lines are available. An additional 8 telephone lines will be installed in the near future. As some users may have noticed, a field has been added on the time accounting information for each step in each listing after each step's JCL. This field follows cpu and wait time figures and appears at "HWM-nnnK". This stands for high water mark and notes for the user the amount of core actually used in this step of the job. It should be noted that this figure can be used to better estimate core requirements for a job. However, the region size for compilers and link-editor supplied by cataloged procedures should not be overridden. Overrriding these regions may result in aborted runs. The sizes specified in the cataloged procedures are determined to allow for correct execution of the programs involved. The minimum allowable region size is now 20K; however, the default region size, if no REGION parameter is specified remains at 74K. NOTES ON CPS 1. The phone number for CPS is 353-5870. This number operates on a roll-over sequence. All CPS ports are accessed through this number. 2. Bugs are still being checked out in CPS RJE. RJE will be flagged as an invalid login mode until problems are taken care of. 3. For selectric keyboards, the following character equivalents are to be used (p.133 of the manual ): ' greater than' (>) uppercase 1 'less than' (<) uppercase 6 'NOT' (-) uppercase exclaim (!) 'OR' (I) exclaim (!) We are in the process of obtaining type balls which have the correct PLI symbols. 4. 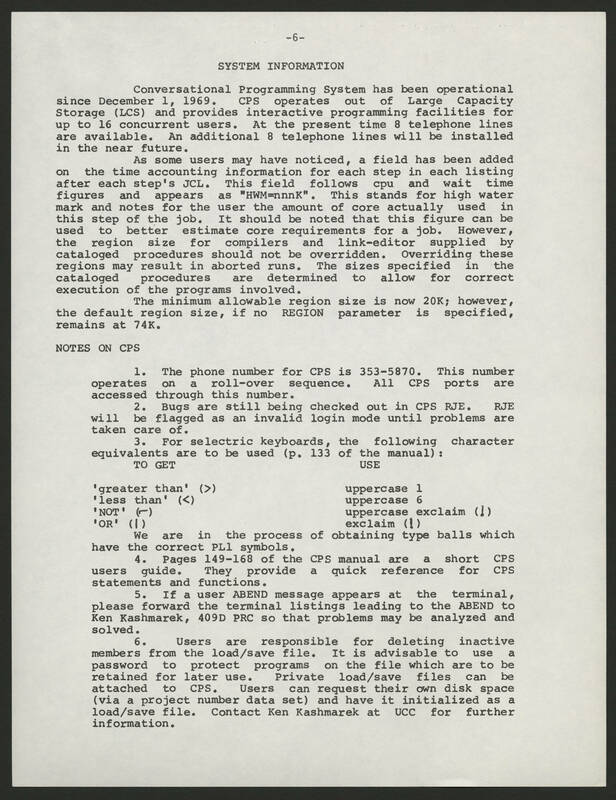 Pages 149-168 of the CPS manual are a short CPS users guide. They provide a quick reference for CPS statements and functions. 5. If a user ABEND message appears at the terminal, please forward the terminal listings leading to the ABEND to Ken Kashmarek, 409D PRC so that problems may be analyzed and solved. 6. Users are responsible for deleting inactive members from the load/save file. It is advisable to use a password to protect programs on the file which are to be retained for later use. Private load/save files can be attached to CPS. Users can request their own disk space (via a project number data set) and have it initialized as a load/save file. Contact Ken Kashmarek at UCC for further information.